YOUR SEARCH IS OVER!! 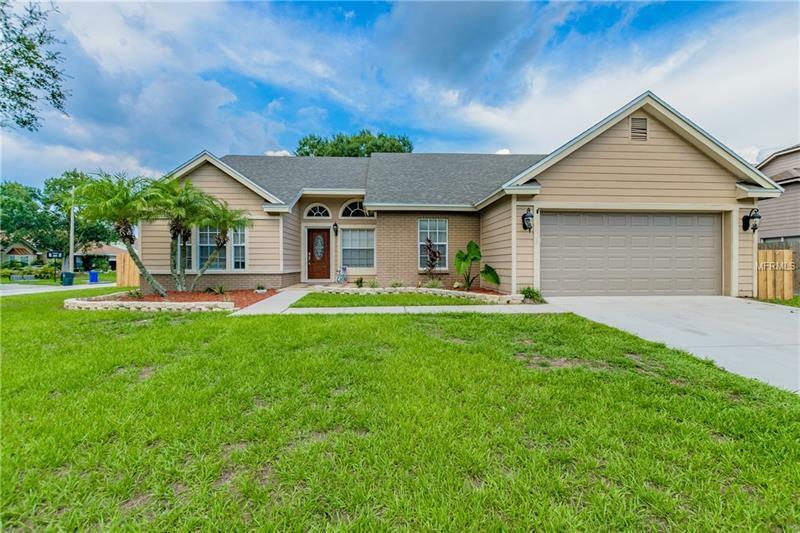 YOU DONT WANT TO MISS THIS REMODELED HOME located in the desirable Boyette Springs community!! Bring your BOAT, RV, or TRAVEL TRAILER because this home sits on a large (0.29 acre) corner lot that is completely fenced!! This home features 4 bedrooms, 2.5 bathrooms, a 2 car garage, a custom kitchen with 2 pantry's, level 4 granite, stainless appliances w/slide-in range, eat in space in the kitchen, new reinforced & insulated garage door, new french doors that lead to oversized covered porch, vaulted ceilings, porcelain wood look tile in all main living areas, laminate floors in bedrooms, tall 7.25" baseboard in the main living areas, new laminate & baseboard in the master bedroom, New Roof, newer AC, NEW WATER HEATER, NEW GRANITE AND DOUBLE SINKS IN MASTER BATH, COMPLETELY REMODELED GUEST BATH!! You’re going to love the 2 extra storage sheds located on the back left and right side of the lot!! The HEATED Inground pool and spa were resurfaced with Diamond Brite coating and the pool deck was resurfaced!! BRING THE PARTY TO YOUR HOUSE with the Tiki Bar and HUGE WOODEN DECK!! You don’t want to miss this home!! Its going to go fast! !